The Stephen Decatur House, a property owned by the National Trust for Historic Preservation, is one of the few remaining examples of domestic architecture designed by Benjamin Henry Latrobe (1764-1820), Surveyor of Public Buildings under President Thomas Jefferson and Architect of the Capitol under President James Monroe. 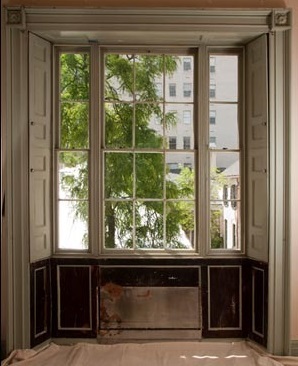 In 2011 Schuettinger Conservation Services, Inc. was hired to develop an extensive survey of the existing original doors, panels, and shutter systems and then based on the analysis provided in the survey conduct the treatment to either uncover and perserve the retained original presentation surface or to replicate its appearance on those surfaces of the shutter systems and panels which no longer retained any of their original coating layers. The project involved both onsite and offsite treatments. 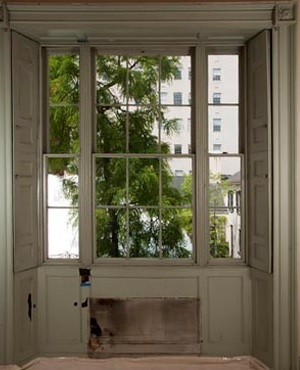 The multiple layers of monochromatic paint on the panel systems surrounding the South and West windows were removed mechanically with scalpels or with the use of specifically designed solvent systems. 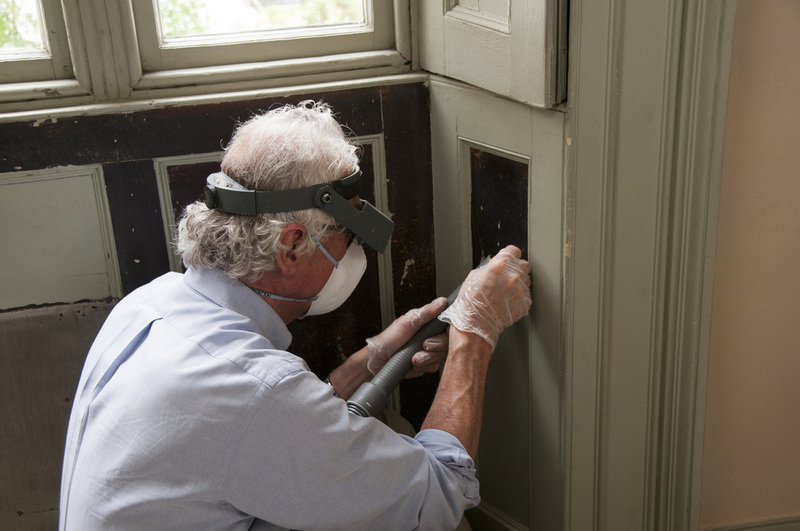 The image below left depicts Bruce Schuettinger carefully removing the multiple paint layers while ensure the fragments were captured with a HEPA filtered vacuum. 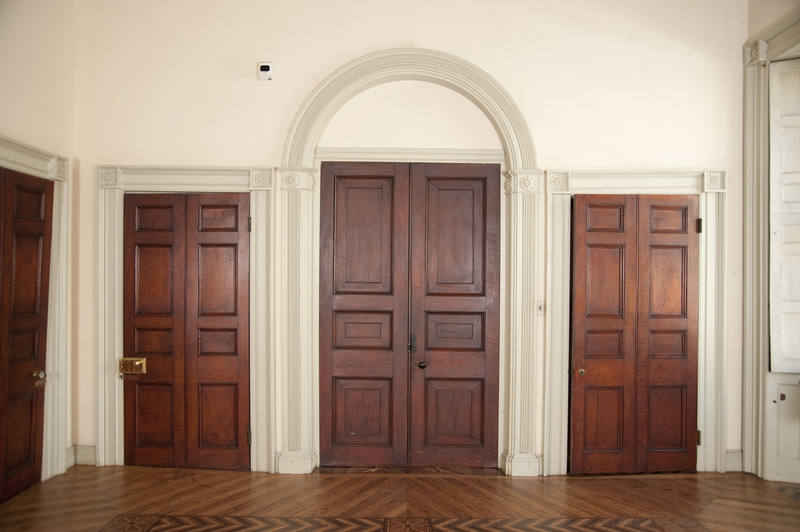 Below: The images below depict a pair of original doors before and after treatment respectively. 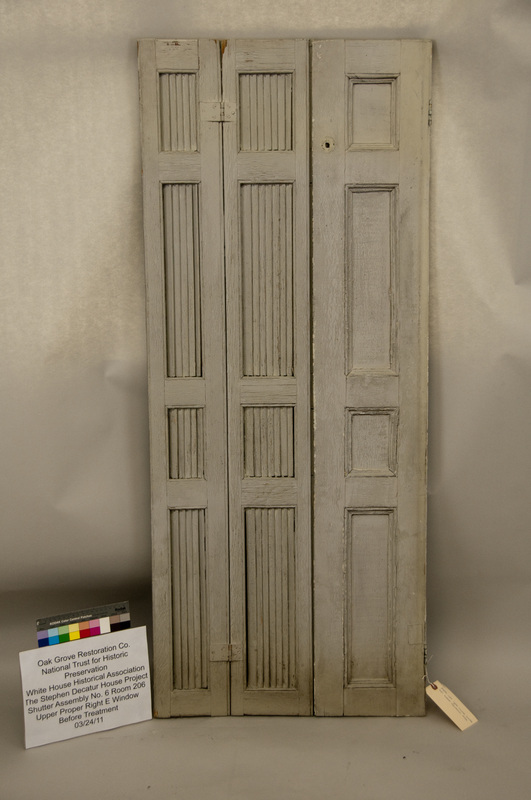 The doors retained much of their original 1818 presentation surface underneath a darkened overvarnish and maintenance oil layer, which were removed utilizing various aqueous and solvent systems while preserving the original coating layers, which were a garnet lac by Fourier Transform Infrad Spectroscopy (FTIR) analysis. Below: These images below depict the before, during, and after treatment states of the presentation surface of the original shutter systems that were a combination of figured hard and soft maple Acer saccharum or Acer rubrum and Eastern white pine Pinus strobus wood identification by microanalysis. 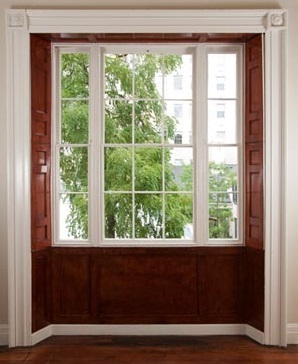 Only the panel which would be part of the panel system surrounding the windows when closed was originally finished to match the other panel components and doors while the other shutter components were painted to match an interior trim color. The treatment of the shutter systems were conducted at our conservation facility in New Market, MD. 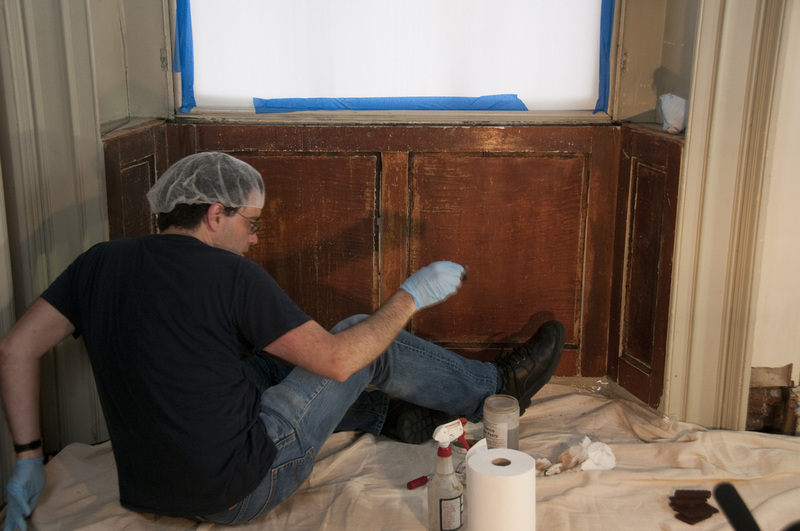 Below: The doors and west window panel and shutter system located in the dining room before and after the treatment. 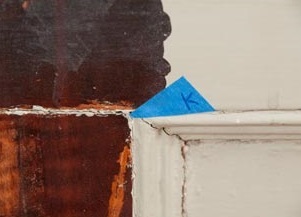 The samples used for the analysis, depicted in the image to the right with the blue masking tape “K”, were extracted from a center panel below the west window at a location where the paint had been removed exposing an area of figured maple. Cross-sectional fluorescent microscopy revealed that the maple wood substrate had an initial shellac coating (black arrows) and remnants of a second resin coating (white arrow). (See microscopic images at the bottom right). Fourier transform infrared spectroscopy (FTIR) tests confirmed these findings. The blue line represents a standard for garnet lac (a variety of shellac). The red line above represents the results from the sample taken at the Decatur House.